"Finally A Definitive Answer On Defeating Social Fear Has Arrived In The Form Of An Effective System That Is So Easy To Apply, Even A Child Could Use It!" Maybe you just hate crowds. Or maybe you don’t like going to parties. Or perhaps the fear goes much deeper than that and in reality, the thought of any social setting simply frightens you to death. Whether you realize it or not, relationships nurture the soul and sharing in the lives of other people is the natural path of human beings yet so many people struggle with the idea of being surrounded by others. Aside from that, they genuinely “miss out” on some of the wonderful and amazing experiences that life has to offer as a result of living in this state of fear. The idea of being a part of any social engagement instills a feeling of uneasiness that can range from mild discomfort to pure terror. And because of this fear, they live basically like prisoners held captive by their own thoughts of meeting and interacting with other people. These interactions could possibly enrich their lives by becoming great friends, lovers, business partners or even soul mates. Sure, soul mates may be destined to meet one another but why waste time ruining your chances of finding this person sooner simply because you are fearful of being placed in social settings? Unless of course you take charge of your life and do something about it. My name is Dr. Steve G. Jones, Ed.D., M.Ed. and I have been practicing hypnotherapy for over 25 years. I can tell you without a shadow of a doubt that I have created a proven system to erase social anxiety in anyone, so that they can begin living the life they so rightly deserve. The reason I can make such a strong statement is because my system for overcoming social anxiety operates on a subconscious level. All of your limiting beliefs and fears are taking place within the subconscious mind. So every time you attempt to change them consciously, you’re basically wasting your time because the subconscious thoughts will always dominate and come to fruition. Therefore, the only truly effective way to make immense changes when it comes to social anxiety is to enter deep into the subconscious mind. And quite honestly, doing hypnosis is something I’ve made quite a reputation for myself. Over the past two and a half decades, I have been helping people dramatically improve their lives through hypnosis. I currently have the largest collection of hypnosis recordings in the world and each one is special in its own way because I have taken every step imaginable to ensure that each recording implants messages into the subconscious in the most effective way possible. 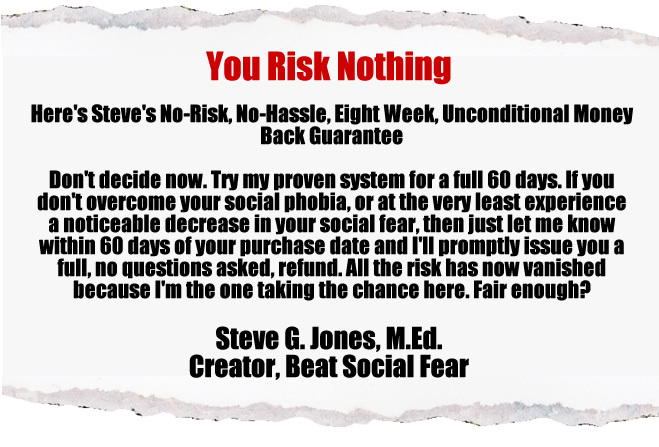 And My New Program, Beat Social Fear, Is No Exception To That Fact! Four Powerful Treatments For Social Fear – The more options you have, the greater your chances for success. 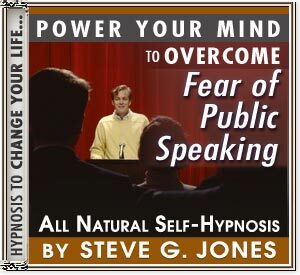 My Patented Hypnotic Method To Beat Social Fear – Using the power of hypnosis, my techniques will rewire your subconscious to destroy your social anxiety forever. If you are sick and tired of Social Fear ruining your life, take control today by ordering this life-changing program for just $27.97. It may be the best investment you ever make. And to ensure your success even further, I am going to include this bonus recording. You can consider this a free gift from me. Click the Button to Order For Just $27.97!